The parade begins at 10 a.m. at Metropolitan Baptist Church on Fair Oaks Avenue and Figueroa Street in Altadena; then heads south on Fair Oaks Avenue before ending at Pasadena’s Robinson Park, 1081 N. Fair Oaks Ave., where the festival takes place from noon to 4 p.m. on the north side of the park. The newly renovated, state-of-the-art Robinson Park Recreation Center will be open during the festival as well. Kaj Goldberg, this year’s Celebrity Grand Marshal, is predicting perfect parade weather! A native of Los Angeles, Kaj earned a bachelor’s degree in communications from the University of San Francisco. His distinguished career in film and television has featured big roles both in front of and behind the camera. After working as an on-air news personality in Palm Springs and Phoenix, Kaj moved back to the greater Los Angeles area as a weather anchor and reporter for CBS2 in Los Angeles. In 2015, he found his home at KTLA’s weather team. Kaj lives in Pasadena and, when not on-air, he and his family enjoy all that this dynamic city has to offer. Celebrity guests also include actors Jackie Long and Chantal Lashon, former NBA player Chris Mills, guest appearances by cheerleaders from the Los Angeles Rams and Los Angeles Lakers, hip-hop artist Yo-Yo and local R&B group Troop. 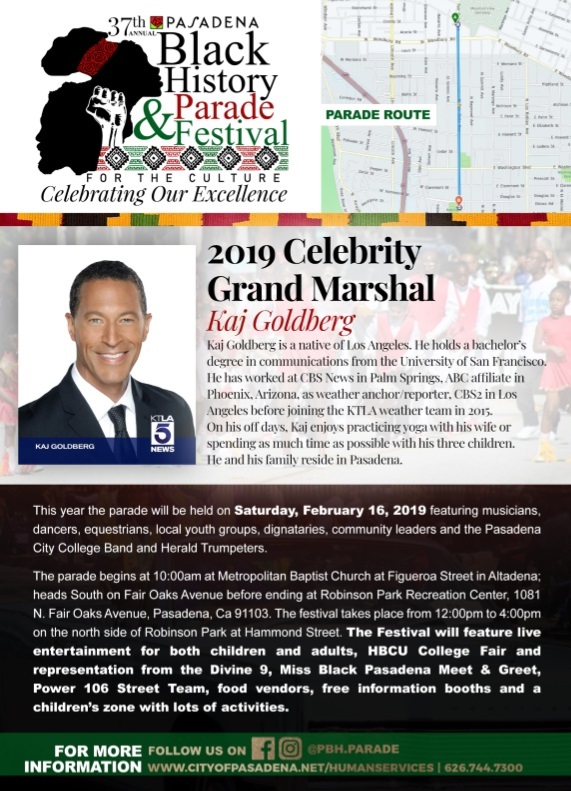 Parade dignitaries also include Community Grand Marshal Betty J. Ford, an accomplished musician and poet, and Youth Grand Marshal Ashley Symone Hackett, member of the Tournament of Roses 2019 Royal Court. Donnetha A. Wallace, teacher and community leader, and Denise Houlemard-Jones, community advocate and businesswoman, are this year’s Community Service Award winners and will be celebrated in the parade as well. The festival begins immediately after the parade and concludes at 4 p.m. 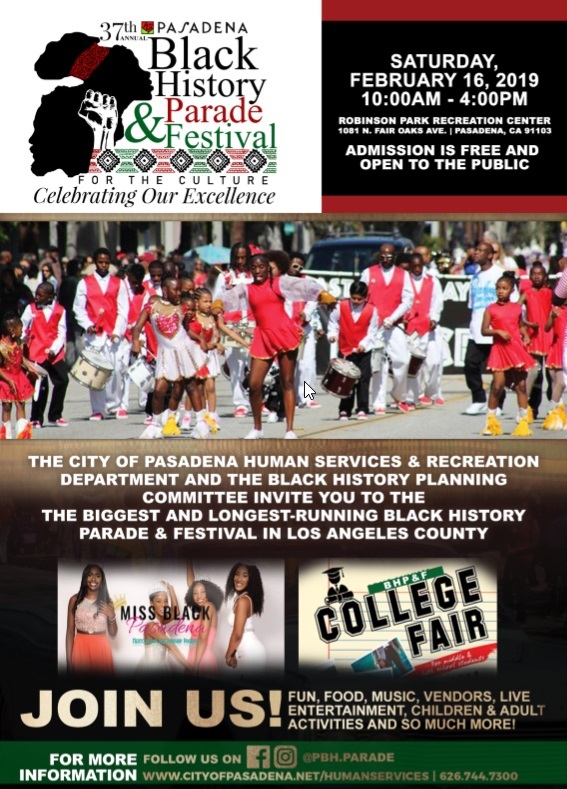 The festival features live entertainment for all ages, food for purchase, an exciting meet-and-greet with Miss Black Pasadena, the Power 106 Street Team, free informational booths and a children’s zone jam packed with fun, free activities. The event is known for a variety of great food available for purchase, including delicious barbecue, chicken and fish dinners, grilled burgers and hot dogs, and fun goodies like kettle corn, lemonade, pies, cakes and ice cream. New this year is a Historically Black College and University (HBCU) College Fair featuring the “Divine Nine,” a network of African American fraternities and sororities. The parade will be recorded in its entirety by Pasadena Media, one of the event sponsors, and will air on both KPAS, the City government TV station, and Arroyo, the Pasadena community public channel. Visit www.pasadenamedia.tv for broadcast times. Attendees are encouraged to arrive early to navigate around street closures, find parking and claim their favorite viewing spots along the parade route. Free parking will be provided on a first-come, first-served basis at Calvary Christian Methodist Episcopal Church, 135 Glorieta St., Pasadena. The following streets will be closed for the parade and festival at the times listed below. Motorists are advised to use caution while driving through the area. Hammond Street, between Fair Oaks Avenue and Morton Avenue, 7 a.m.-6 p.m.
Morton Avenue, between Mountain Street and Woodbury Road, 9 a.m.-5 p.m.
Mountain Street, between Raymond Avenue and Sunset Street, 9 a.m.-1:30 p.m.
Fair Oaks Avenue between Mountain Street and Woodbury Road, 9 a.m.-1:30 p.m. The 2019 parade and festival are sponsored by Wells Fargo, Pasadena Tournament of Roses, Wescom Credit Union, Los Angeles County Supervisor Kathryn Barger and Pasadena City College. Media sponsors are the Pasadena Journal, Pasadena Black Pages and Pasadena Media. Black history events are organized by the Department of Human Services and Recreation and the volunteer Black History Parade and Festival Planning Committee. A full list of planned events can be viewed here. For more information about the parade and festival, contact the Jackie Robinson Community Center at (626) 744-7300.